Well hello! I realize that it has been quite a while now since my last post. I really miss blogging and still frequently find myself composing posts in my head, but when it comes time to actually post something, I skid to a stop. This is in large part because I’ve been struggling a lot with balancing/reconciling my new identity as a mother (a new mother, a working mother, a breastfeeding mother, etc.) with the identity of the blog and whether I even want to continue to write about “vegan” recipes. 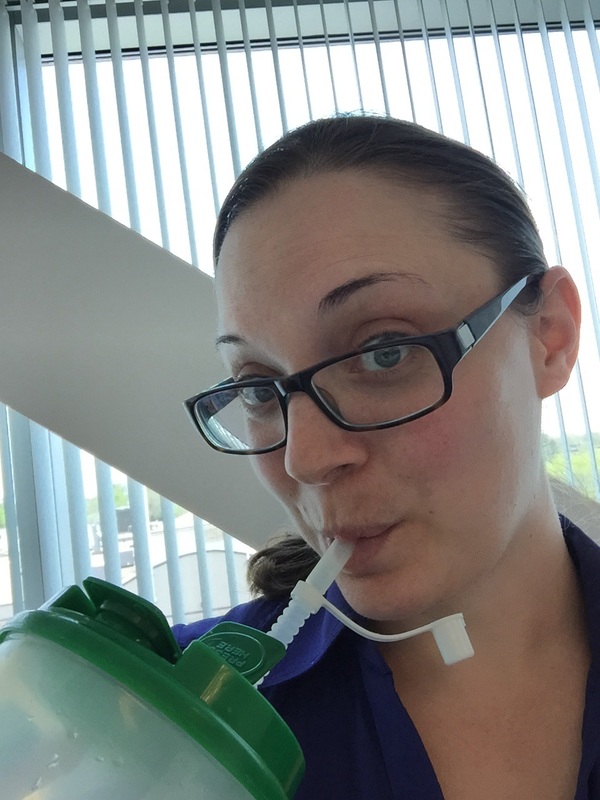 You see, not long ago I stumbled across this post on one of my favorite blogs, Angela Liddon’s Oh She Glows, in which Angela explained the decision she and her husband had reached with regard to their infant daughter’s diet. The comments on the post are exactly what you’d expect, and I don’t suggest reading them if you don’t want to get sucked down a black hole of holier-than-thou vitriole pitted against can’t-we-all-get-along sanctimony. I bring it up only to explain the impact that this post had on me, particularly after years and years of trying so hard to ignore all of the hate the Internet has to offer, and instead focus on my own goal of bringing some positivity and light-heartedness into the mix. I think I have for the most part succeeded, inasmuch as my blog has never in the 7 years of its existence sparked a giant comment war or controversy. But it doesn’t mean that I don’t notice and react when these things blow up in other corners of the Internet that I frequent. I know that I shouldn’t care what others think–and to a large extent I guess I don’t–but I am a diplomatic person by nature and I strive to please as many people as possible at all times, to be mindful of how my words and actions might make people feel, and not to step on too many toes. However, I have come to realize how truly insurmountable these goals are, especially on a public blog! What the above-mentioned blog post made me realize is that I will never be “vegan” enough for the vegans and I will never be “plant-based” enough for the healthnuts. Even after all these years, it made me feel defeated and less-than. Maybe that’s stupid but that’s how I felt. This kind of all-or-nothing and you-can’t-sit-with-us attitude can turn people off entirely from even dabbling in different lifestyles or ways of thinking, because why even bother? I have resolved to remove labels from my life. I think it will have the effect of making me feel more comfortable posting about my life on this very public blog. There will always be those who troll the internet looking for a fight or things to criticize. But I hope that by removing my labels some of those people will move along because they will realize that I truly don’t care what other people do or what they call themselves. All I can be is me. 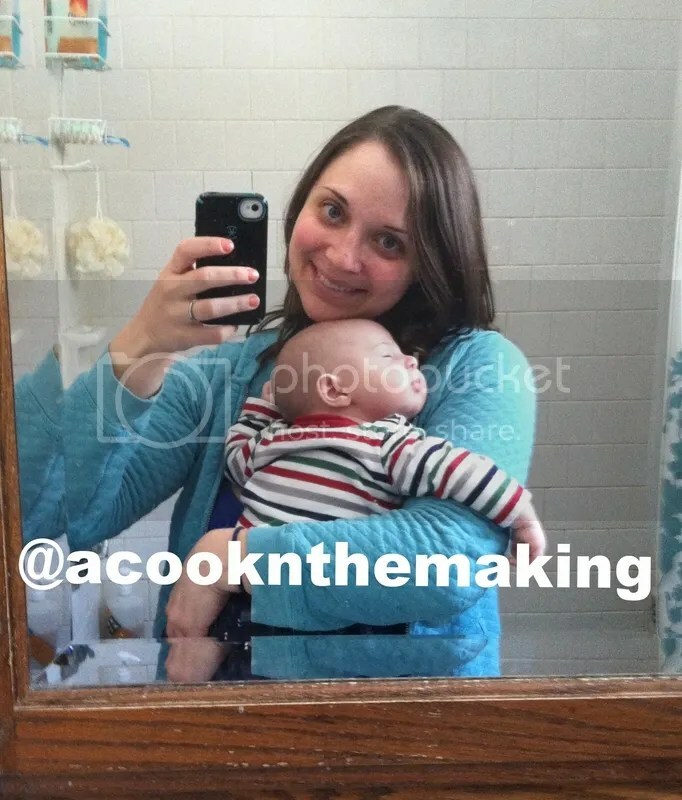 And “me” is someone who right now is finding the utmost pleasure in taking her almost 7-month-old (!!) 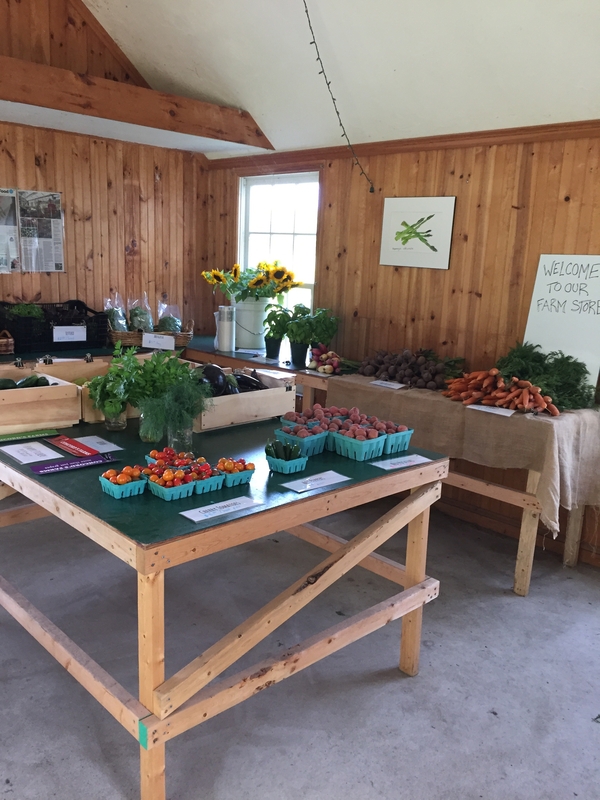 out to farms and farmstands to see the beautiful produce that grows all around us. Baby H is so curious about and aware of his surroundings now and it’s a joy to watch him taking in all of the different colors and shapes! I’m also really enjoying making the little guy’s food now that he is eating solids twice a day. He is a huge fan of all foods so far, and I’m having a blast mixing up different flavors and textures for him to try. 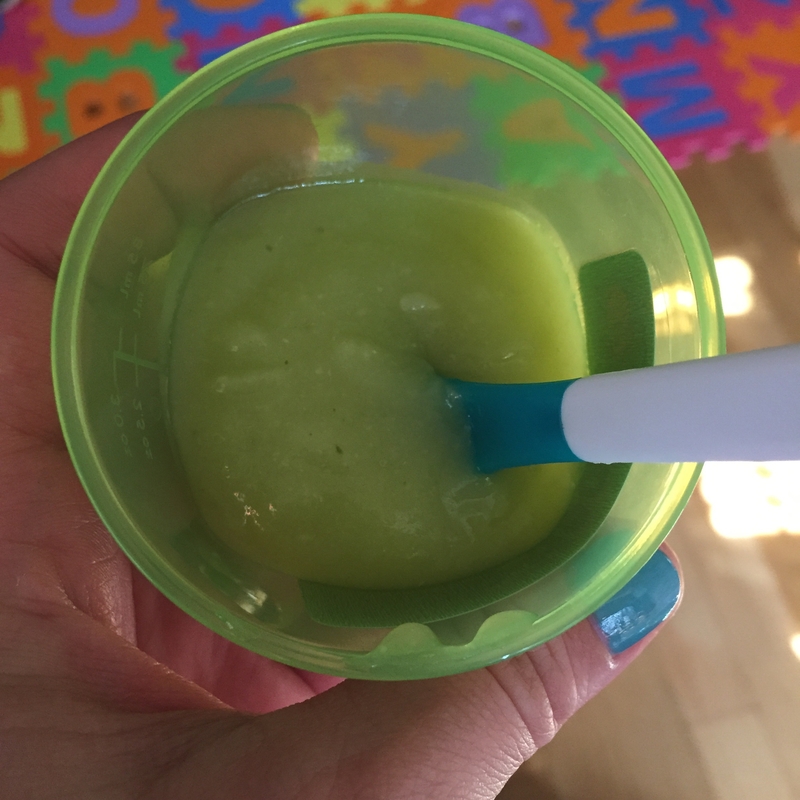 His most recent favorite has been zucchini that I steamed and pureed with garlic and a few basil leaves. There might be some who will see this and be shocked that I am feeding my baby purees instead of doing baby-led weaning, or tell me that zucchini isn’t an appropriate early food because of x, y, or z study and zooomg SIDS!!1! or some other such nonsense. But let this post be exhibit A of me not caring. I’m going to post what I want going forward–no more labels! I’m doing it, you guys…I’m taking the first step toward regaining some semblance of my old life where I cared so, so much about health and fitness. Starting today, I’ll be doing the 30-Day Flat Abs Challenge from Blogilates. I’m choosing this because it seriously will take like 10 minutes max on any given day for me to do these exercises so really, it’s something I should be able to fit in despite all the baby craziness–no excuses! I do kinda miss being able to balance things on my belly, though. However, I feel confident that I will feel better about myself, and I’m hopeful that this will clear a path for me to really commit to my own health and wellness over the summer. I can’t believe it’s been almost a month since my last post. I know that I personally don’t enjoy reading blog posts where the author starts out with drawn out explanations and apologies for being away, but I do have some reasons for my long silence and I’d like to at least address them briefly. My life has changed dramatically in the past few months since Baby H was born. I still love blogging and I definitely still love food, but both of those things have shifted way down on my list of daily priorities. I’ve been back at work for a little over a month now and am only just starting to get settled into some sort of a rhythm, albeit a hectic one. Each day, I get up, pack Baby H’s daycare bag, drop him off at daycare, sit in traffic on the way to work, work all day (as well as fitting in 3 pumping sessions), then leave work, sit in traffic on my way to pick up Baby H from daycare, and then go home and spend the rest of the evening trying to entertain him until bedtime, while simultaneously attempting to clean bottles and breast pump parts and get everything ready for the next day when I get to do it all over again. It’s not just that I don’t have the time and energy to blog, but also that the subject matter I used to write about has become kind of inapplicable. I basically never cook anymore. If I have time to eat in the evening, I do, but it’s not like I’m whipping up any culinary marvels. Case in point: last Tuesday, for Cinco de Mayo, I really wanted tacos. So, I made some. 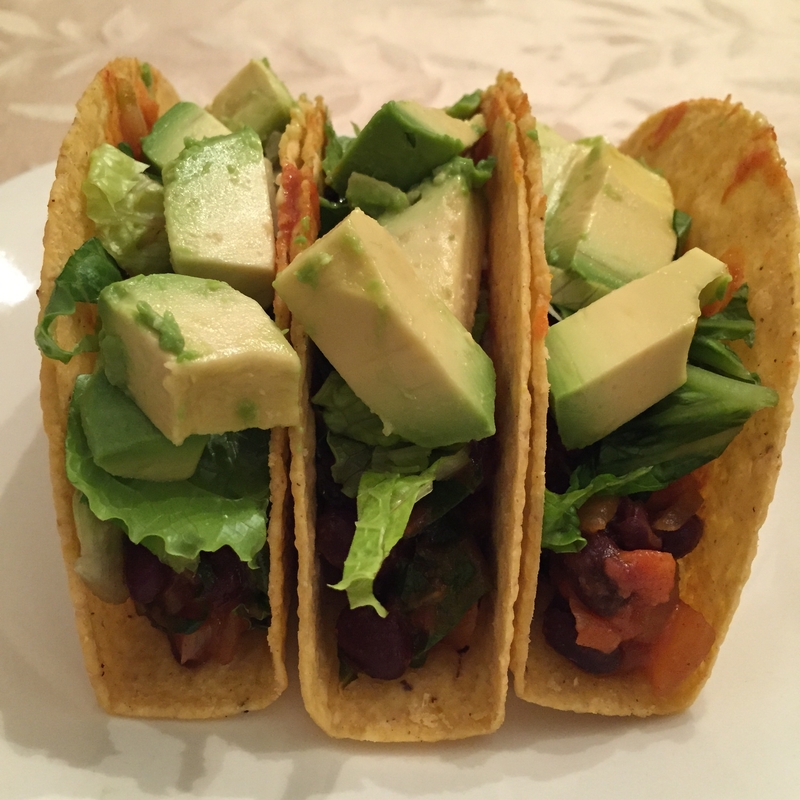 I made the easiest, most bare bones black bean tacos imaginable, using several premade ingredients (shells, seasoning, etc.). All I did was saute some chopped onions and garlic, add a 15 oz. can of rinsed black beans, an 8 oz. 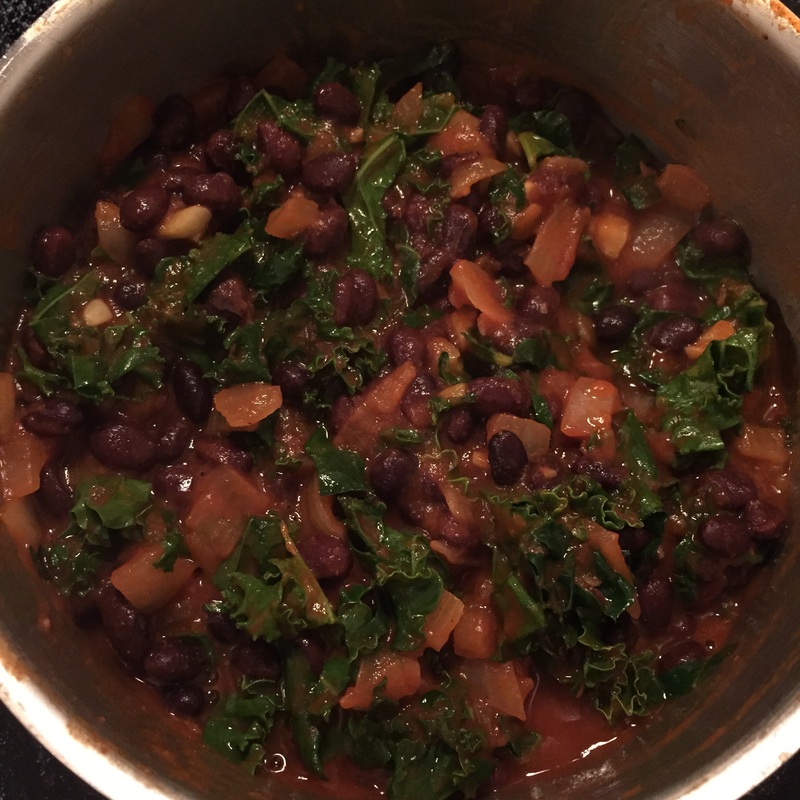 can of tomato sauce, and half a packet of taco seasoning, and then I stirred in some chopped kale at the end. 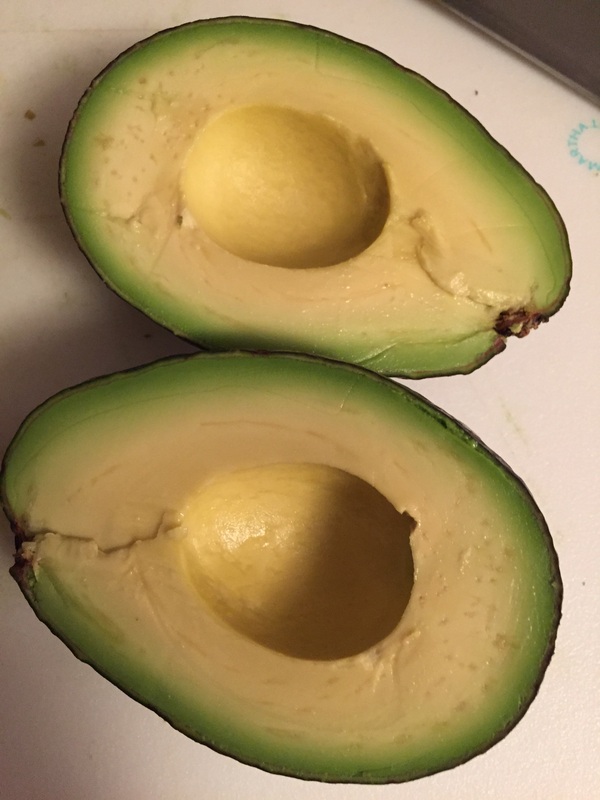 I did manage to pick out an amazing avocado for a topper! The tacos came out really tasty but, like, is that really something to blog about? I’m not sure anymore. It was the first time I had cooked anything since Baby H was 9 weeks old (he’s 17 weeks now). I couldn’t even get it together to bake a cake for his christening this past weekend. We ended up serving a storebought (non-vegan) cake instead. So, this is the biggest thing that’s been keeping me away from blogging–this feeling that I no longer have anything worthwhile to share about vegan cooking and eating. The point of this post is not to have a pity party however, but to give myself a chance to get back on track with blogging by allowing myself a bit more flexibility with the theme. It’s my blog after all! Going forward I will be focusing more on mindful eating and an overall healthy lifestyle, especially with an infant in tow, and my posts will reflect this. I hope the content will still be interesting enough that those who have read this blog for a long time will want to stick around, but of course I’ll understand if some decide to move on. Finally, I do intend to keep posting photos of delicious vegan food on social media, so if this is of interest to you, definitely follow me on Instagram! I’ll be posting lots of good stuff with the hastag #whatveganseat. Today is the two-year anniversary of the Boston Marathon bombings, and it has been weighing heavily on my mind. I have shared my thoughts about that terrible day twice before on this blog. 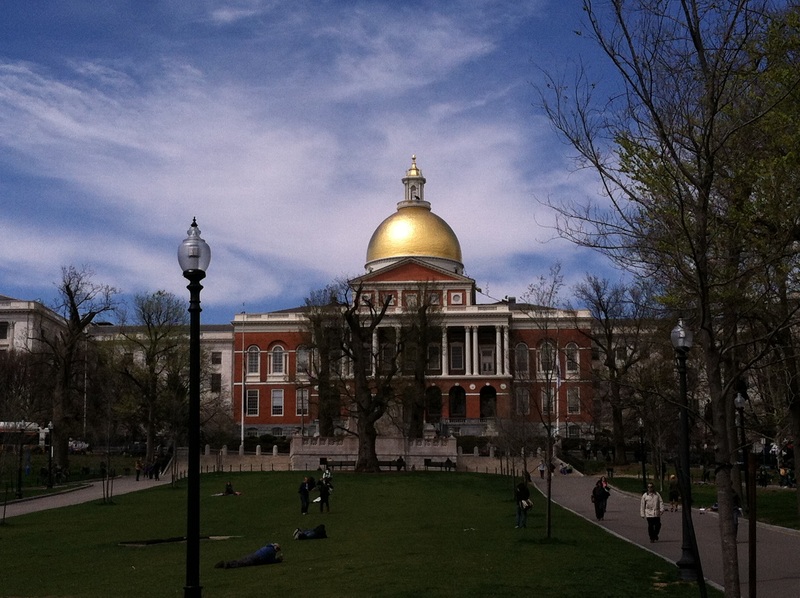 On April 22, 2013, one week after the bombs went off, I shared my first-hand account of that day and the days that followed. A year later, I wrote about the regrowth that had taken place in the year since the bombs had gone off. Another year has gone by, and this one brought us the trial and conviction of the cowardly terrorist whose actions brought about the deaths of four innocent people and the maiming of countless others. Personally, his conviction does little to lift my spirits, as it can in no way make up for the pain, fear, and damage he caused. But it does in its own way mean justice for the victims, and I sincerely hope it has brought them and their families some peace and comfort. And so we continue to move on, to heal, and to remember. And yes, I will be bringing my infant son out to celebrate his first Patriots Day on Monday. It seems to me that the best way we can honor the memories of those that were lost is to continue to live our lives as joyfully as possible, without fear. As the days until I have to return to work rapidly dwindle, it seems my to-do list just gets longer and longer. I’m trying not to stress over it and to instead focus on enjoying these last few days where it’s just me and the little guy. I’m especially determined to enjoy this time coming off of last week, which was not the most fun one we’ve had. I got sick (for the first time in, like, seven years) and my sickness coincided with a major sleep regression for Baby H. It was a tough week, but we’ve both come out the other end alive and in one piece, and I feel like I’ve definitely earned my stripes through this motherhood rite of passage. During that hellish week, I found myself with very few chances to eat. This was partially due to a reduced appetite, and also to my desperate quest to catch any amount of sleep I could whenever the opportunity presented itself. 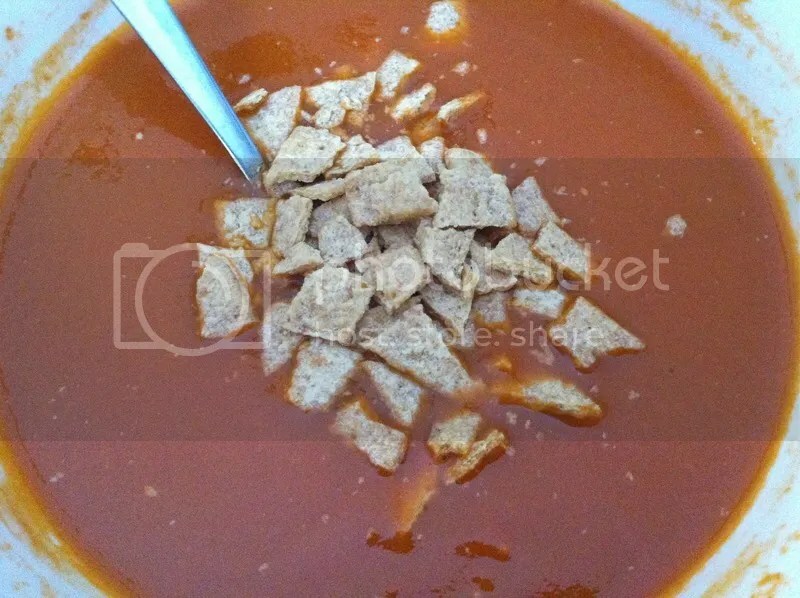 One thing that worked out amazingly well for me though was the super-simple standby of soup and crackers. 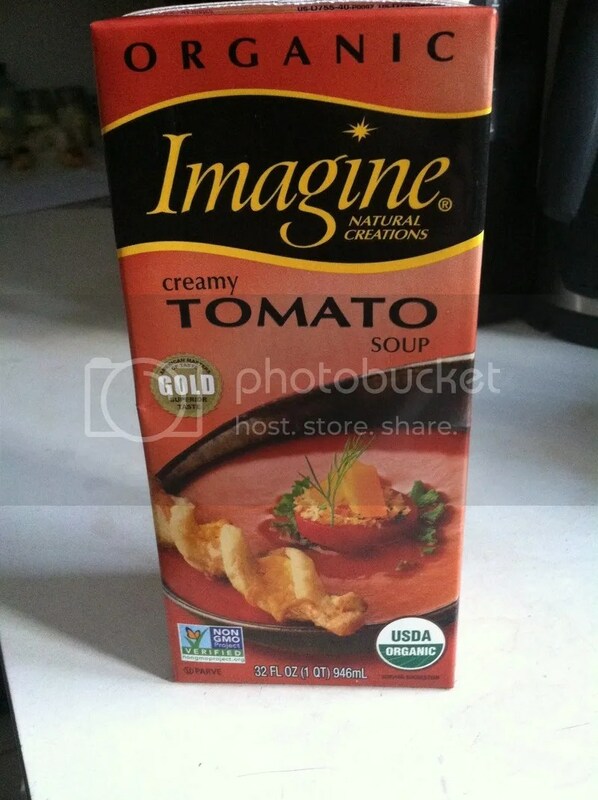 I bought this box of Imagine tomato soup a couple of months ago when I was stocking up for maternity leave, and it was perfect. 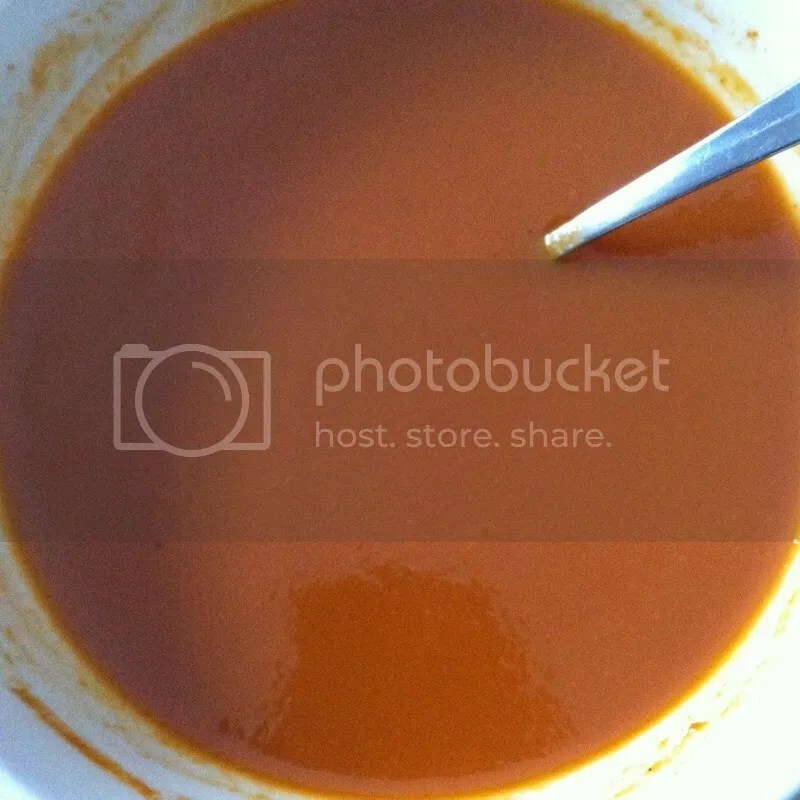 Not only was it quick and easy on the tummy, but there’s nothing quite like a steaming bowl of soup to help you fight off bouts of the chills. I normally would skip over any tomato soup labeled “creamy,” but I was familiar with the brand so I decided to check the ingredients list, and what do you know? It’s vegan! It tastes exactly like the sugary, canned junk of my childhood but is so much more wholesome. And don’t worry, I balanced out the healthiness of the soup by adding some crushed up Wheat Thins (speaking of sugary junk! haha) on top. 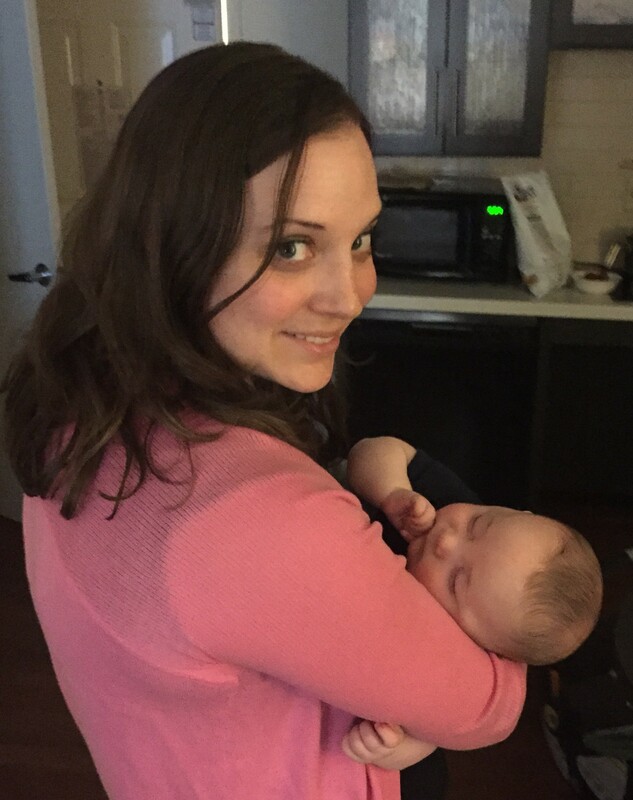 Whew–it’s been another whirlwind couple of weeks! One week, poor Baby H was sick with an ear infection, followed by a big growth spurt, then the week after it was time for his two-month checkup (complete with his first round of shots). He has grown so much already and is becoming more fun, alert, and engaging every day as he learns more and more about his world. All I can really do is try to keep up! It isn’t always easy to take good care of myself when it feels like all of my energy is being put toward this miraculous new person. My diet has been far less than stellar and oftentimes I forget to eat at all. And then there are other times when the little guy FINALLY falls asleep that I am racing to fit in at least 1 or 2 of the 68094887324 things on my to-do list. This is my dining room table right now. I’m trying to sort through Baby H’s clothes, putting away the stuff that doesn’t fit him anymore (there’s a lot of it!) and organizing the stuff that does so that it’s easier and quicker to get him dressed throughout the day (and yes, he goes through multiple outfit changes daily!). Enter last night; around 6:00, baby boy went down for (what I thought was) his pre-bedtime nap and I figured I’d finally have the time to tackle some of the clothes sorting. That was when I realized that I hadn’t eaten anything since about noon. So the plan changes to: eat, then sort. Fortunately, in the fridge I had a big batch of Red Lentil Cauliflower Curry (an all-time fave from Veganomicon) that I cooked up last week when my mom was here visiting and watching the baby. I grabbed a baggie of brown rice that I had cooked and frozen when Baby H was about 3 weeks old and stuck it in the microwave to defrost for a few minutes. 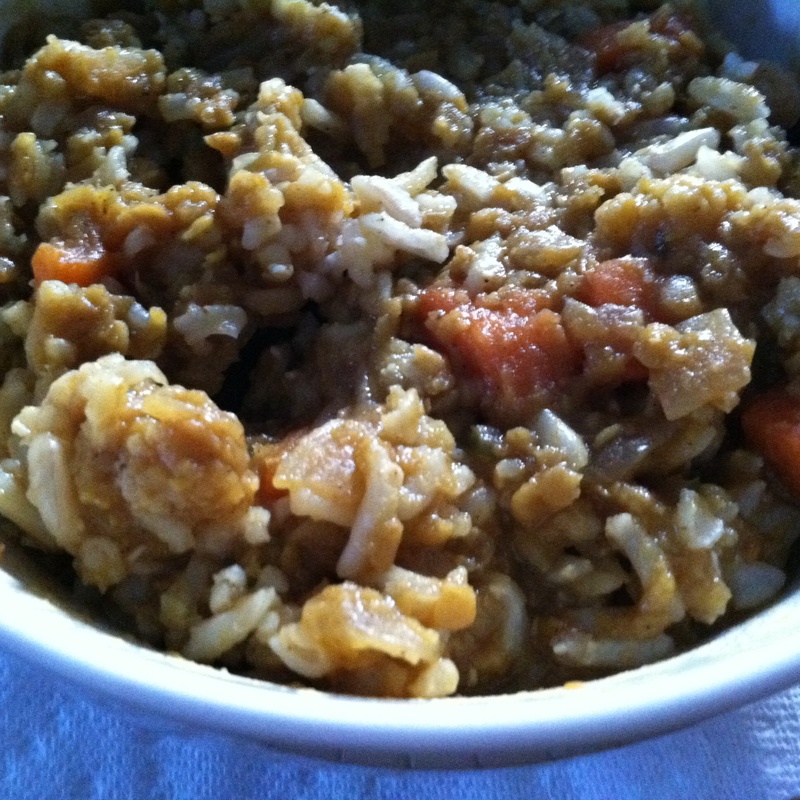 Once Baby H was back down, I went back downstairs, added the curry to the defrosted rice, and began to heat them up. Once it was ready, I began to eat and even started drafting a blog post. Except that not five minutes later the crying started again (this time sounding pretty mad, actually). I hurriedly shoveled the last few bites of curry into my mouth and went back upstairs to pick up Baby H again. So, the clothes are still covering the dining room table. But at least I had dinner! 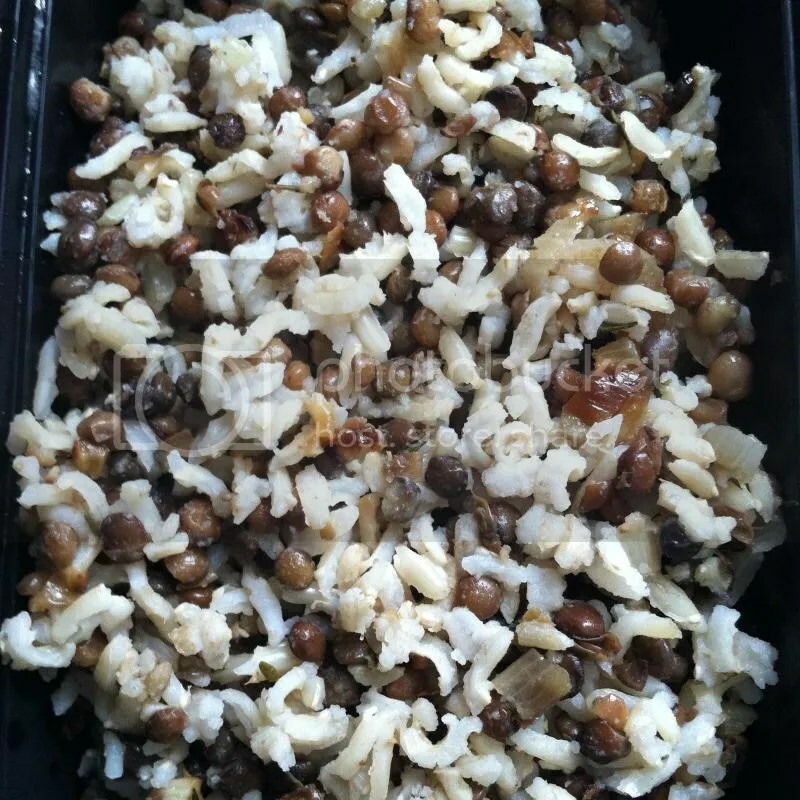 Even though a good deal of my last post talked about lentils, I’m talking about them again today because I actually found the time to create and cook a recipe, albeit a very simple one. But sometimes simplicity is all you need. 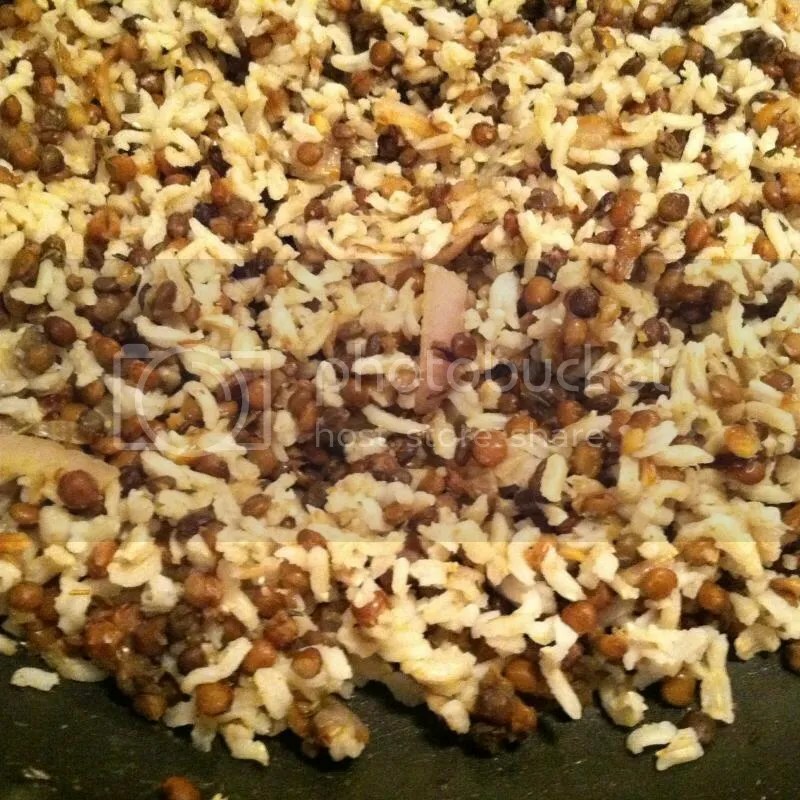 This pilaf tastes great hot or cold and makes a really nice side to almost any entree. In a large saucepan, saute shallot and garlic in olive oil for 5-8 minutes over medium-high heat until soft and slightly browned. Add lentils, garlic salt, and thyme, and stir well. Lower heat and add rice. Stir to warm through. Taste and adjust seasonings as desired. In the interest of full disclosure, I should tell you that I used the pre-cooked lentils from Trader Joe’s in this dish. But really, lentils are so easy and quick to cook from dry that you won’t be ceding any of your laziness cred if you cook your own to use in this dish.